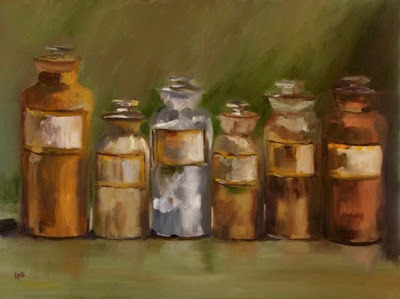 Kate Faust, “The Apothecary, oil on canvas, 16” x 24.” Images are from the artist’s website. 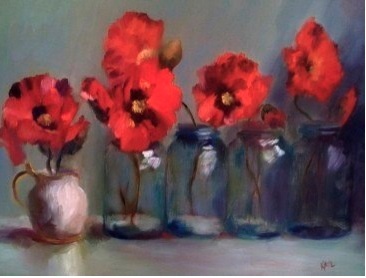 Four years ago she began painting at the Ridgewood Art Institute (RAI) and has never looked back. “I try to capture prismatic light and atmospheric effects that have been taught to me by John Osborne and Lorraine Minetto,” she said. 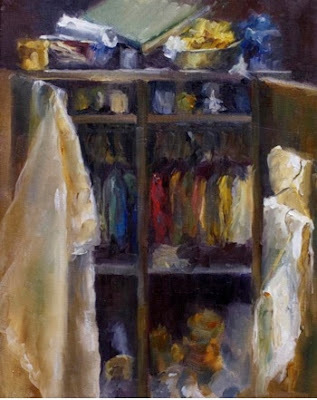 Faust is currently also displaying three pear paintings at a group show of oil paintings at the Salmagundi Club in New York City. Reread this post (including Comments). And then, as Pam Allara used to say in my art history classes at Tufts, compare and contrast. Refreshing. While I like a good concept as much as anyone, I sometimes think painting is being used these days to convey too much information and so-called meaning. Painters load their work up with allusions, allegory, and references and then have to write an artist's statement to prove that what they are painting is "relevant" and reflects the social order. Enough already. Why not leave a little room for the viewer? Why not just paint a picture?